﻿ PigProgress - Is it possible to get rid of tail docking? Tail docking is a well-known practice in pig production, but it is also heavily criticised. An international team of researchers dived into the topic and wondered what its exact effects are on pigs – and what alternatives there are to avoid tail biting. The widespread practice of tail docking is in fact meant as a prevention of another problem: tail biting. For quite some years, however, tail docking has become debated in the European Union for welfare reasons. It is here where theory (don’t do it) and practice (it’s difficult to do without) collide. For that reason, the international scientific project FareWellDock was started up a number of years ago. This project involved researchers from various countries in Europe, including Finland, Denmark, France, Norway, Sweden, the UK, the Netherlands and even the United States. How bad is tail docking exactly, as well as tail docking and which alternative methods exist to prevent tail biting? These are topics the researchers looked into. Obviously, the researchers aimed to stimulate the development towards a non-docking policy in the EU. In March 2017, the project was concluded and it presented an overview and results – some handy recommendations can be found in the box. The project’s first objective was to evaluate measures of acute and chronic pain in relation to tail damage. This included assessment of the short (acute trauma), medium (post trauma inflammation) and long term (traumatic neuroma formation) pain associated with tail docking in neonatal piglets, and the possible consequences for longer term fear of humans. In addition, the studies assessed the effects of tail damage in more mature pigs to provide a basis for assessing the pain associated with being tail bitten in later life. Finally, studies were conducted to assess the effects of an NSAID analgesic on the short term responses to neonatal tail docking. Experimental studies confirmed that piglets do experience pain when tail docked, and that pain relief treatment, such as meloxicam, can lessen but not abolish the physiological stress reaction to docking. Piglets which have been tail docked seem more fearful of people afterwards than undocked animals. In docked tails, no difference in pain sensitivity of the tail (as measured by behavioural withdrawal) is detected after eight weeks, but changes in the functioning of the sensory nerves from the tail can still be measured after four months, which suggests that the possibility of longer term pain exists. When the tail is damaged later in life, as happens with tail biting, changes in both tail stump sensitivity and nerve functioning can last for at least four months, and possibly beyond. The second objective was to evaluate the role of manipulable material when reducing the need for tail docking. The aim was to develop and validate ways to assess if on-farm use of manipulable material is sufficient to reduce tail biting. Furthermore, the aim was to describe suitable methods for implementing the use of straw under commercial farming conditions and to investigate, in on-farm conditions, the efficiency of tail docking vs. enrichment given in sufficient quantity to reduce the occurrence of tail lesions. A screening method to assess the appropriateness of the level of enrichment on-farm was developed and includes scoring of the amount of unsoiled straw, the behaviour, and ear, tail and flank lesions of the pigs. Animal-material interaction sensors were used for e.g. to show that pigs in biter pens were more interested in novel ropes than pigs in control pens, that environmental enrichment may reduce exploratory behaviour of point-source objects, and that sick pigs, experimentally infected with streptococcus species, were less interested in chain manipulation. Sensors appear to be a promising tool to assess the use of manipulable material by pigs. In Sweden and Finland, where tail docking is not done, farmers report using on average 30 to 50 g of straw/pig/day, equivalent to about 0.5 litre/pig/day. The effect of both measures, i.e. docking and straw, reduced tail biting nine-fold. Furthermore, it was shown that increasing the amount of straw from 10 to up to 400 g/pig/day had multiple positive effects by progressively reducing the occurrence of tail injuries and stomach ulcers, increasing growth rate, increasing straw-directed behaviour, and reducing redirected behaviours towards other pigs. The third aim was to clarify the role of poor health in the causation of tail biting and victimisation, and the aim was to study early identification of tail biting outbreaks. In addition, the aim to develop automated systems for early warning of tail biting outbreaks. The results of experimental and on-farm studies showed that the social behaviour of sick pigs differs from healthy pen mates, as pigs with osteochondrosis received more sniffing and tail bites from their pen mates than healthy pigs, while pigs with mild respiratory disease tended to bite more at the ears and tails of pen mates than healthy pigs did. In addition, studies of cytokines suggest that low-grade inflammation may decrease activity and increase receiving sniffs and attacks from other pigs. 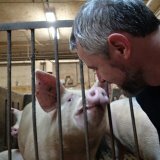 Studies on data sets from commercial pig farms indicated that changes in feeding behaviour may be an important sign of an increased risk for tail biting to occur: Future tail bitten individuals showed a reduced feed intake already two to three weeks before tail damage became evident. Furthermore, feeding behaviour in groups which develop tail biting may differ from non-biting groups for at least ten weeks prior to an injurious tail biting outbreak. It was also shown that tail-chewing activity may start two to three weeks before tail damage can be seen. A detailed behavioural study of tail biting events revealed that there appears to be no such thing as a ‘typical’ tail biting event and that the behaviour shown immediately before a tail biting event does not differ from behaviour prior to another type of social interaction, namely ano-genital sniffing. Thus, it seems difficult to predict if a social event will escalate into tail biting or not. However, tail biting is more likely between pigs that have previously interacted. Data sets from several countries and studies indicated an association between tail biting damage and tear staining, but the direction of this association is not clear. * This article is an approved summary of the Executive Summary which was published earlier this year at http://farewelldock.eu. In future issues of Pig Progress, to be published later this year, several participating researchers in this project will delve deeper into the individual topics they encountered. Thank you for this article Vincent. Very interesting! My veterinary health team have been facing increasing challenges with managing tail biting in recent years. Genetics are unquestionably playing a huge role, but of course there are many co-factors. For interest sake we tried leaving tails intact in one batch last year in a population of pigs that we would describe as having a calm disposition. We won't do that again for a while! Clearly we need to better understand this complex social behaviour issue.